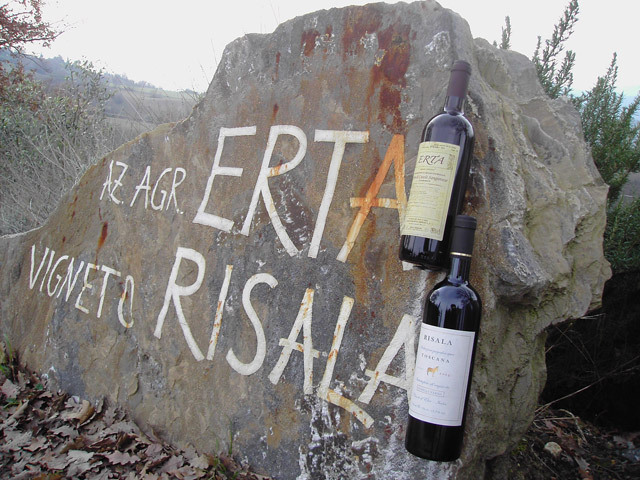 Erta is noted around Casole and throughout Tuscany for the wine it produces. This wine is made from at least 85% of Sangiovese grapes and complimented by other black grapes such as Merlot, Petit Verdeau or Foglia Tonda. The grapes are carefully selectioned and made into wine using traditional methods, making wine that is an expression of the flavours and perfumes of the land they are grown on. The clarification, followed by natural decanting can cause some sediment after a long time in the bottle. It is advisable to serve at a temperature of between 16 – 18°C. 1200 bottles are produced each year. This wine is a red Tuscan IGT, produced with the best grapes of the year. It is aged for 18 months in oak barrels before being bottled and left for another 6 months, minimum, in the bottles. The selection of these grapes is made by a drastic harvest that leaves just one bunch for every vine shoot, depending on the dimensions of the bunch. Following this, comes the vegetative selection, eliminating the first two female shoots. During the ripening period, towards September, after verifying the sugar quantity, the leaves are thinned – firstly those facing north and after 10 days, the south facing leaves. The south-west facing vineyard has an excellent exposure during the summer period. Fertilizing is alternated: one year is organic, planting barley and wheat in alternate rows, while the following year a light chemical fertilizer is used. 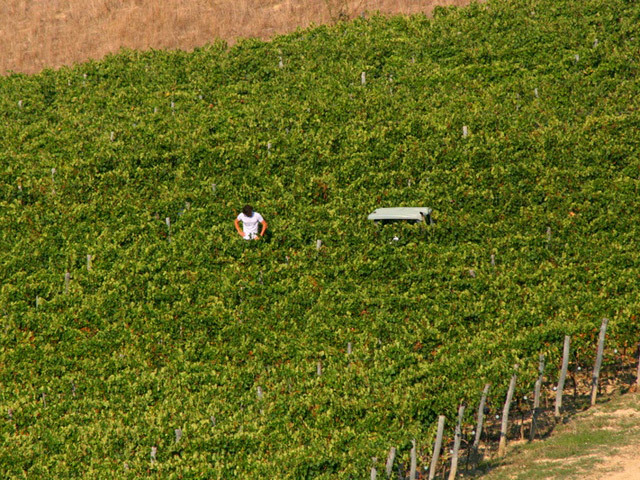 The harvest for Risala is carried out late – the last harvest on the farm. Only 600 bottles a year are produced. 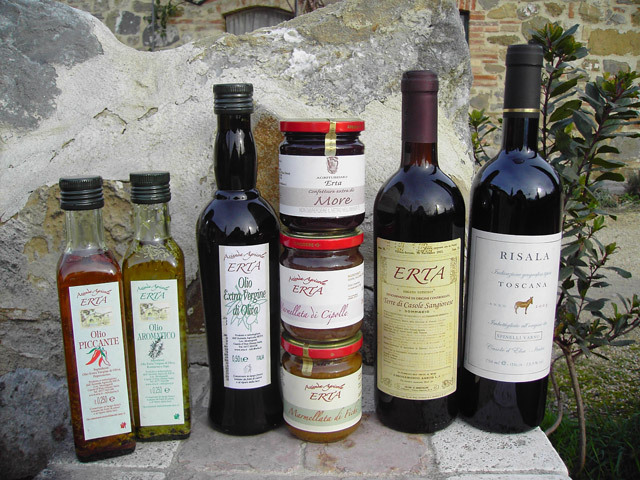 What can one say about Erta’s olive oil? One needs to have been present from April to November, walking through the olive groves and witnessing the ripening of the fruit on the trees that in Ithaca, held Odesseus and Penelope’s bed. Once the olives are almost ready for picking, great nets are prepared and intensive days of work with the nets, crates, the tractor and finally the oil mill, await. The result of all this is a cold pressed, extra virgin olive oil, with virtually no acidity, that evolves in its flavour and perfume day after day. As soon as it is pressed, it is a bright green colour and has a sharpness to it, perfect to use as a condiment. It is wonderful with salt cod in its first days of pressing – an absolutely unique gastronomic experience. Erta’s oil is flavoured by Varno, with rosemary o hot chili pepper and is an excellent for adding flavour to winter soups and summer salads. The vegetable garden produces tomatoes, artichokes, onions, courgettes amongst other vegetables, that are prepared for consumption during the winter. Everything is rigorously organic and the quality and flavour depend entirely upon the clemency of the weather and our care. All our guests can taste the tomato sauce, the onion jam (delicious with ricotta cheese), fig and blackberry conserve and many other products.